I’m thrilled to announce that the STEM Academy now has its first Student Council! I’ll be serving as the council’s advisor this year – a role that has lead to some entertaining discussions with students over the distinction between a school counselor and a student council! I am excited to begin working with such a talented group of students. In order to showcase the hard work put in by all of our candidates, we’d like to share some information on the election process with our Sandwich community. A student council is a representative group designed to work with the full student body, staff, and administration to improve school climate and develop programs that benefit the entire school. In order to foster school spirit and build the STEM community, we created a unified STEM Student Council. Our goal is to help 7th and 8th graders work together as one community, rather than as two entirely separate grades. 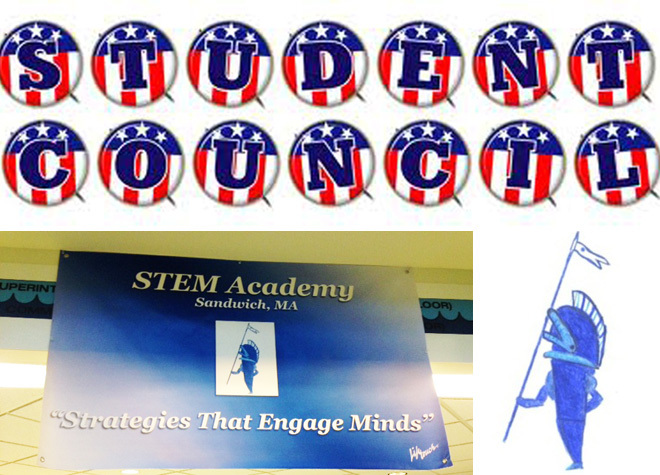 Our STEM Student Council has two components – an Executive Board and a Leadership Committee. The Leadership Committee is the general assembly portion of the Student Council. This is open to ALL students. Members are an equally important part of Student Council and will be involved in all program planning. This format was developed based on discussions with the SHS Student Council, the formats used by other local schools, and resources from the National Association of Student Councils. We’re hoping it will allow all students the opportunity to participate and develop leadership and governing skills. Once the council format was announced at an assembly, students interested in running for an officer position received an election checklist and packet. They completed an application, received guardian permission, obtained nomination signatures from their peers, and then returned all forms to me. Following the campaign guidelines in their packet, students then developed posters and speeches. Posters filled all STEM wing bulletin boards and clearly showcased the artistic talent and cleverness of our students. Many STEM staff members have mentioned being impressed with the quality of their work! Candidates each met individually with me to review their speeches and get tips on how to best present themselves. Once all final drafts were completed, students met with me to record speech videos. With 37 candidates and over 530 STEM students, we decided to utilize our new technology rather than have students miss multiple classes to sit through a large and lengthy assembly! Only accessible with a Sandwich Google account, a site was created on which students could view their classmates’ speeches and submit their votes electronically. Unfortunately, we hit a few snags with the internet speed on Tuesday morning. While some classes saw the videos and voted without issue, others struggled to load all videos. I consider myself very lucky to be part of a staff that works so well as a team to problem-solve! On Wednesday, we were able to set up “viewing classrooms” for those students who had not seen videos and all students were able to vote either on their Chromebooks or by submitting a ballot to me throughout the day on Wednesday. If students had internet access and logged on to their Sandwich Google account, they were also able to submit their votes at home Tuesday evening. By lunchtime on Wednesday, each and every student reported that they were able to vote. We were quite impressed with students’ ability to be calm and flexible problem-solvers in the face of these technical difficulties! I met briefly with all other candidates this afternoon and plan to do so again later this week so that they can begin getting to know one another as Leadership Committee members. Every candidate demonstrated their leadership skills throughout this election process and I am looking forward to hearing all of their ideas. I was also impressed by how supportive they were of one another – a great sign for what the full Student Council will be able to accomplish going forwards! Congrats again to all candidates! You can learn more about the National Association of Student councils, by clicking on the logo.